The global commercial production for human use of fish and other aquatic organisms occurs in two ways: they are either captured wild by commercial fishing or they are cultivated and harvested using aquacultural and farming techniques. According to the Food and Agriculture Organization (FAO), the world production in 2005 consisted of 93.2 million tonnes captured by commercial fishing in wild fisheries, plus 48.1 million tonnes produced by fish farms. In addition, 1.3 million tons of aquatic plants (seaweed etc.) were captured in wild fisheries and 14.8 million tons were produced by aquaculture. The number of individual fish caught in the wild has been estimated at 0.97-2.7 trillion per year (not counting fish farms or marine invertebrates). 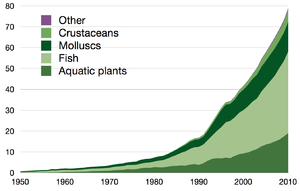 The following table shows the capture production by groups of species (fish, crustaceans, molluscs, etc.) in tonnes. The following table shows the fish production in 2004 and projections for 2010 and later simulation target years. All figures, other than percentages, are in million tonnes. ^ FAO (2005) Part 4. ^ a b c FAO (2002) The State of World Fisheries and Aquaculture 2002. Rome. ^ Delgado, C; Wada, N; Rosegrant, M; Meijer, S and Ahmed, M (2003) Fish to 2020: supply and demand in changing global markets. International Food Policy research Institute. Washington, DC. FAO: Summary tables of Fishery Statistics Rome. Retirved 28 November 2009. This page was last edited on 28 March 2019, at 00:24 (UTC).